Panthei Osha (Odia: ପନ୍ଥେଇ ପୂଜା) or Chaitra Mangalabara Osha(Odia: ଚୈତ୍ର ମଙ୍ଗଳବାର ଓଷା) is a festival observing in Odisha during the lunar month of Chaitra in Hindu Callender (mid-March to mid-April). This festival is celebrated on the Tuesdays only by worshiping Goddes Mangala, seeking blessings of Maa for the well being of their family. * This photo is captured by Tapas Ranjana. Holi is the festival of colors. The festival signifies the victory of good over evil, the arrival of spring, end of winter, and for many a festive day to meet others, play and laugh, forget and forgive, and repair the broken relationships, and is also celebrated as a thanksgiving for a good harvest. What is Dola Jatra or Dola Melana?? In Odisha, the walking idol of Radhakrushna comes out and goes around the village and finally, the Melana takes place in some field, where a festival arranges. Mainly this festival observed some days before Holi- Rangotsaba or on the previous day of Rangotsaba or on the Rangotsaba. Some-days before the Rangotsaba, there are many shops opened to sell the colors. Now-a-days the colors sold in these shops are mixed with different chemicals which may have some dangerous impact on the human skin. A few years ago, I also suffered from this type of chemical infection with these colors. 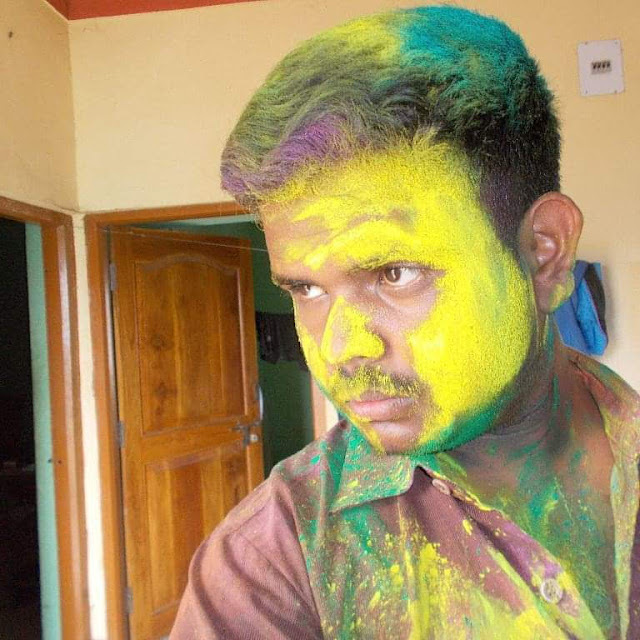 Some of my friends poured those chemical mixed colors over me after that it took 4 to 5 days to be cured. From that day, I stop playing with these chemical based colors and prefer the colors formed from the natural processes. It's my request to use natural colors. Don't prefer the chemical mixed colors, it may have some bad impact on someones' skin. And one more thing, Don't play or pour these colors with the animals, because they are not able to share their feelings and the bad impacts on them through these colors. Especially use the dry colors which may not need more water to be cleaned. Have a Safe and Happy Holi. Stay away from these chemical mixed colors.